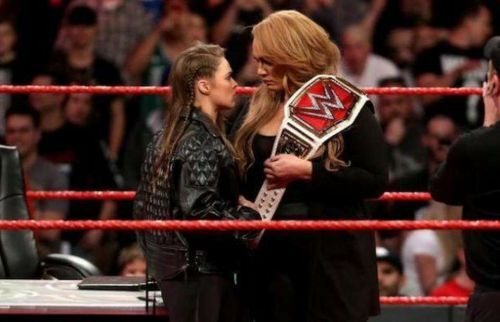 Nia Jax has botched a number of moves in the ring throughout the course of her main roster career and it appears that even the loved ones of WWE stars are now worried about their spouses' safety when stepping in the ring with Jax. Jax injured Becky Lynch to the point where she was forced to pull out of Survivor Series and her huge match with Ronda Rousey, this isn't the only person that Jax has injured throughout her time on the main roster, since Charlotte, Alexa Bliss, and Zelina Vega have also fallen victim to The Irresistible Force over the years. Jax has since been rewarded with a push towards the Women's Championship, which hasn't sat well with many fans since they blame Jax for the fact that they missed out on a huge match between Lynch and Rousey because of her right hand. Ember Moon was chosen as Ronda Rousey's partner to take on Tamina Snuka and Nia Jax in the main event of Monday Night Raw and it appears that her husband was worried about her safety in the match, since she has been injured by the star before. Matthew Palmer is an Independent superstar and only recently married Ember Moon. Interestingly, he deleted this Tweet that was posted part way through Monday's show but fans were able to take screenshots and share them online. Jax's move-set has been diluted over the past few weeks and it's allowed her to avoid her usual botches, so it appears that even though Jax has been given a push on-screen, WWE is keeping an eye on the former Champion throughout.